Premier Houseboats are pleased to present this as yet unnamed new build houseboat, offering contemporary living on a fibre glass hull. 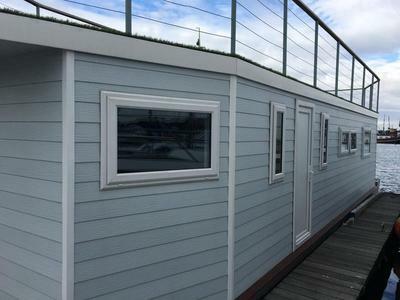 This Houseboat has been built over the last year and offers affordable ongoing costs together with modern accommodation, and also has the benefit of a roof terrace to enjoy your surroundings. The boat is well insulated throughout, and benefits from full gas central heating, double glazed windows throughout, and excellent headroom. Entrance is through a side front door that leads into a hallway. There is a double bedroom, with room for a double bed and wardrobe. The bathroom is a good size and has a bath with shower attachment, toilet and hand basin. The main living area is an open plan kitchen and lounge area. There are multi colour LED lights throughout.The kitchen has a brand new fridge/freezer, microwave and gas oven, plenty of work top and soft closing units.A well decorated area with good sized windows and sliding patio doors, this is a comfortable and light living space. There is an L shaped settee/sofa bed in the lounge, and laminate flooring throughout. Patio doors lead to a small deck with steps leading to an astro turfed roof terrace covering the entire boat, with railings around and stunning views. Externally, the boat is clad and has colour changing entrance lights. Vessel name: Maggie Vessel condition: Good Year constructed: 2017 Berths: 2 Cabins: 1 Length over all: 42' Beam: 10' Maximum draft: 1' Hull material: Glass Fibre Hull type: Flat Disclaimer Premier Houseboats offers the details of this advert in good faith as it was presented by the seller or his representative but cannot guarantee or warrant the accuracy of this information nor warrant the condition of the described item within this advert. A buyer should instruct his agents, or his surveyors, to investigate such details as the buyer desires validated. The Item described within this advert is offered subject to prior sale, price change, or withdrawal without notice.